In the same way weather determines our activities for the day, weather patterns also affect fishing conditions. Sunny, warm days and afternoons full of light rain each bring different fish to the surface while driving others deeper underwater. Better keep your eye on the sky; here’s how weather affects your fishing! Light rain that washes insects and bait into the water forms an ideal fishing scenario. Fish that eat insects bite more when it rains as they search for their prey in the water. Light rain and cloudy conditions also help camouflage you from the fish. In comparison, heavier rains and downpours drive fish deeper underwater. Fish have a harder time seeing the bait during heavy rains, and the change in the current makes the fish move slower than usual. Fish respond to changes in barometric pressure, becoming more active when the pressure rises or lowers. When weather conditions present higher pressure and warmer temperatures, fish swim around in deeper water to find cover. Lower pressure with cooler temperatures and precipitation cause the fish to hunt for food in shallow water, making this a good time for fishing. Once the air pressure tops or bottoms out, fish typically tend to bite less and become more sluggish. While people typically gravitate towards warm, sunny days and high temperatures, fish sometimes do not respond well to the hot sun. In fact, they tend to move into cooler, deeper waters, to avoid the heat. During sunny days, the best time to go fishing is in the early morning or early evening once the hottest parts of the day are over. In comparison, cloudy days keep the sun away from the fish, making the water cooler and more comfortable and thus causing fish to feed more actively. 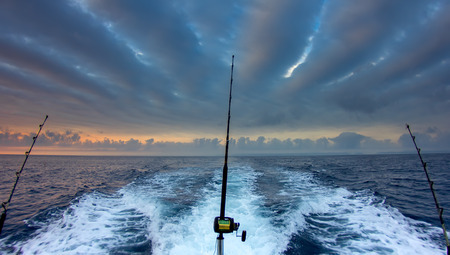 Different weather patterns change fishing conditions, so check the forecast before heading out on your next fishing trip! Explore the Gulf waters off the coast of Alabama with some offshore charter fishing under Captain Chad Reyer. Board the Triple Trouble to find Grouper, Snapper, Swordfish, and more in the Gulf. Sit back, relax, and give us a call at 256-431-5767 today to plan your charter trip in Alabama! Holiday Shopping? Try a Charter for that Fishing Fanatic! Fall and Winter Fishing: What’s Hot for Orange Beach Fishing Charters? Summer May be Ending, but Not Fishing Season!